The main feature of FAST VP is reduce Total Cost of Ownership, by maintaining high performance, using mix of expensive and cheaper disks. The main idea is based on the fact, that only part (usually not more than 5%) of the data is accessed frequently. Based on that sentence we can put those “more-active data” located on Heterogenous pools on higher Tier to lower the read response time. Look at the picture below showing before/after. Highest Available Tier – this policy is used when quick response times are a priority. The Highest Available Tier policy starts with the hottest (fastest) slices first and places them in the highest available tier until the tier’s capacity or performance capability limit is hit. Auto-Tier – a small portion of a large st of data may be responsible for most of the I/O activity in a system. This policy allows for moving a small percentage of the ‘hot’ data to higher tiers while maintaining the rest of the data in the lower tiers. The Auto-Tier automatically relocates data to the most appropriate tier based on the activity level of each data slice. LUNs set with Highest available Tier take precedence in case of limited capacity of high tier. Start High then Auto-Tier – This policy is default for each newly created pool LUN (on heterogenous pools obviously). It takes advantage of the Highest Available Tier and Auto-Tier policies. Start High then Auto-Tier sets the preferred tier for initial data allocation to the highest performing disk drives wich available space. After some time it relocates the LUN’s data based on the performance statistics and the auto-tiering algorithm. Lowest Available Tier – this policy is used when cost effectiveness is the highest priority. Data is initially places on the lowest available tier with capacity. It’s perfect for LUNs that are not performance or response-time sensitive. 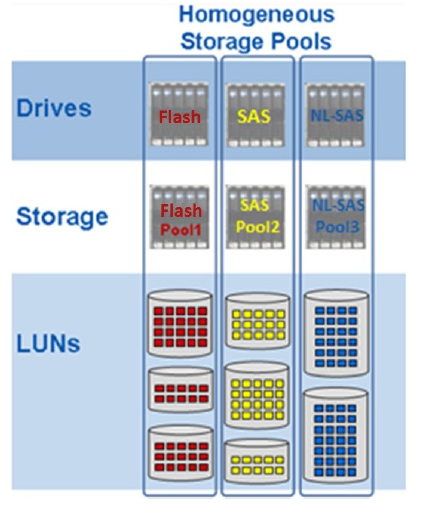 All slices of these LUNs will remain on the lowest storage tier available in the pool, regardless of their activity level. No Data Movement – this policy can be chosen only after a LUN is created. Data remains in its current position, so the performance and response-time is predictable. The data can still be relocated within the tier, and the system still collects statistics on these slices, so if you change the policy (for example to Auto-Tier) the Storage Array has all necessary information to move portion of data to appropriate tiers. Paused – all data relocations for system are paused. 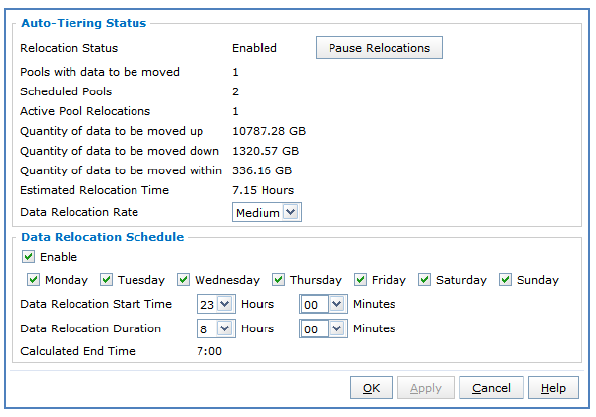 As I mentioned before FAST VP feature allows for automatic data relocation based on a user-defined relocation schedule. 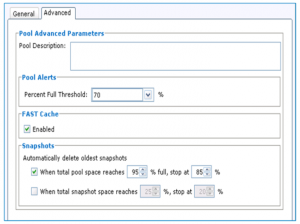 The schedule defines when and how frequently the array starts data relocation on the participating storage pools. 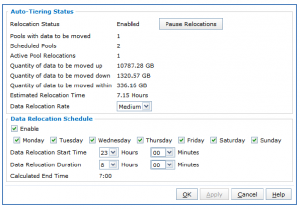 The Data Relocation Schedule section enables you to define the operational rate for the data relocation operation. Values are low, medium, high. Low has the least impact on system performance, high has the most impact. The default value is medium. 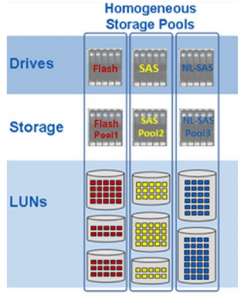 Once you learn the choice of creating RAID groups, and provisioning storage through LUNs created on RAID vs Storage Pool concept I’m sure you would like to learn how to create a Storage Pool. 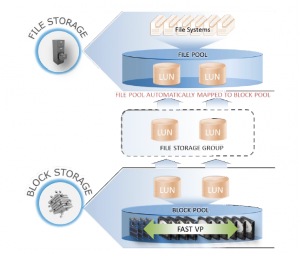 If you don’t know what that is, try to read my previous post EMC VNX – RAID groups vs Storage Pools. What you should know? 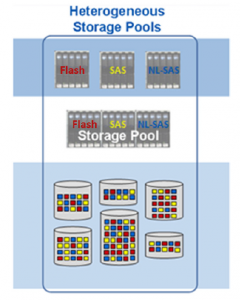 Basically what is a Storage Pool, what is the difference between Homogeneous pool and Heterogeneous pool. Creating a pool is quite simple, all you need is to provide a pool name, choose the disks and choose the protection level. 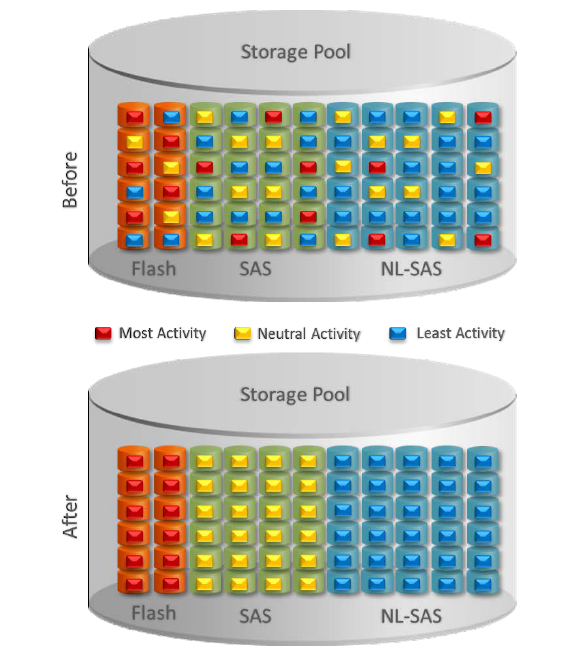 Presented figure shows an example of creating a heterogeneous storage pool with name Pool 1, and 3 disk types, with RAID5 for Flash and SAS disks, and RAID6 for NL-SAS disks. 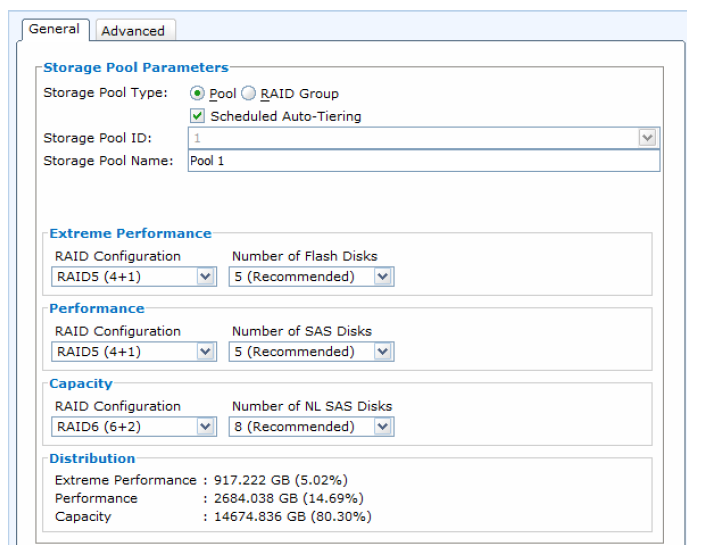 The Scheduled Auto-Tiering box is visible only when the FAST enabler is installed and the Pool radio button is selected. 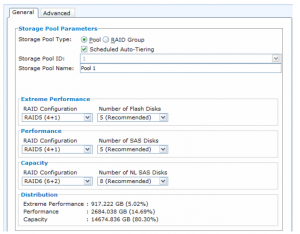 Once you select that option, you will include this storage pool in the auto-tiering schedule. I bet you wonder what is in Advanced box, don’t you? 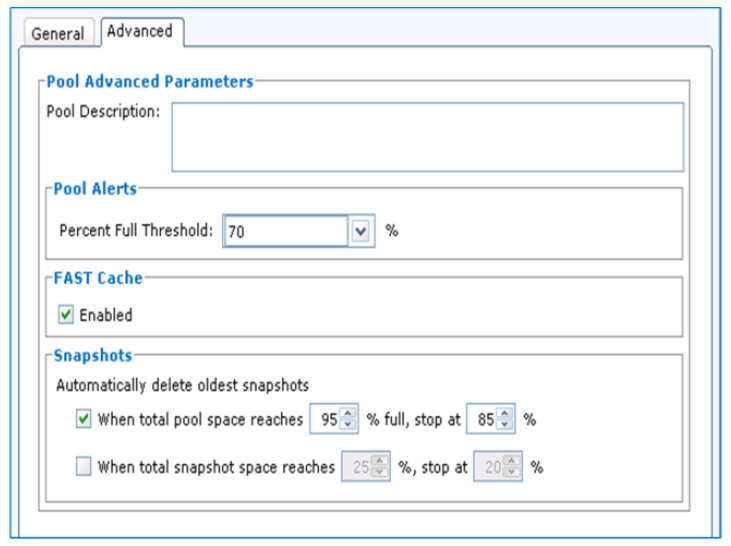 The Advanced tab can be selected to configure Thresholds and FAST Cache (of course if the FAST Cache enabler is present when the pool is created). Snapshot section will be available if the Snapshot enabler is loaded. As present in the printscreen, you can schedule automatically deletion of snapshots if the monitored space is above chosen threshold. 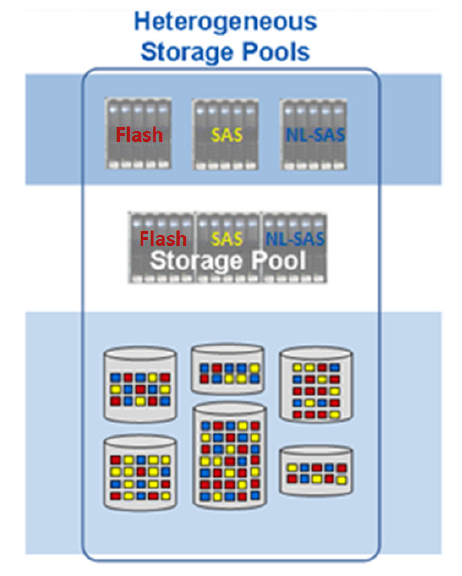 A VNX can contain one or many pools. Pools can be as large as the maximum number of drives (expect vault drives and hot spares obviously), lathough there are limits of maximum allowed drive increment. 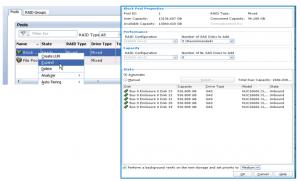 For example with VNX5300 you can create a pool with maximum of 40 drives at a time, but later you can expand this pool with another 40 drives to reach 80 disks in total. You can easily expand RAID Group, and Pools. To do so, you need to have extra hard drives available. Right-click on the pool, and select Expand. The operation is simple. 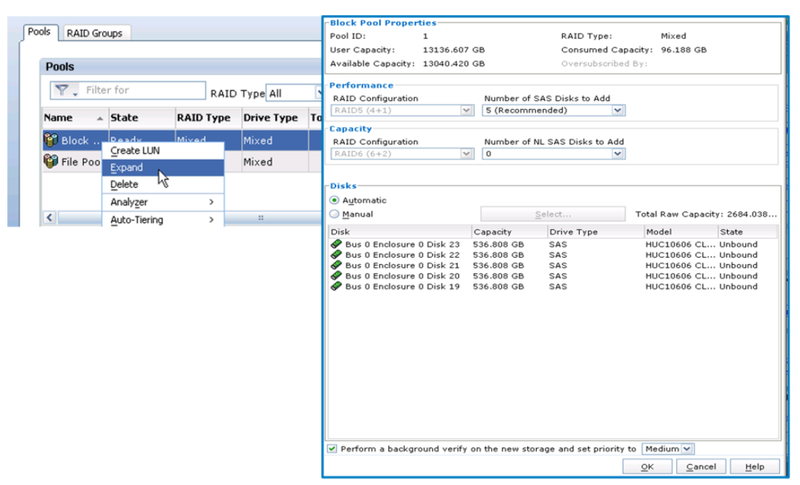 From the Expand Storage Pool window, select the number of disks by using the dropdown arrow. Remember the limit of creating big Pools? 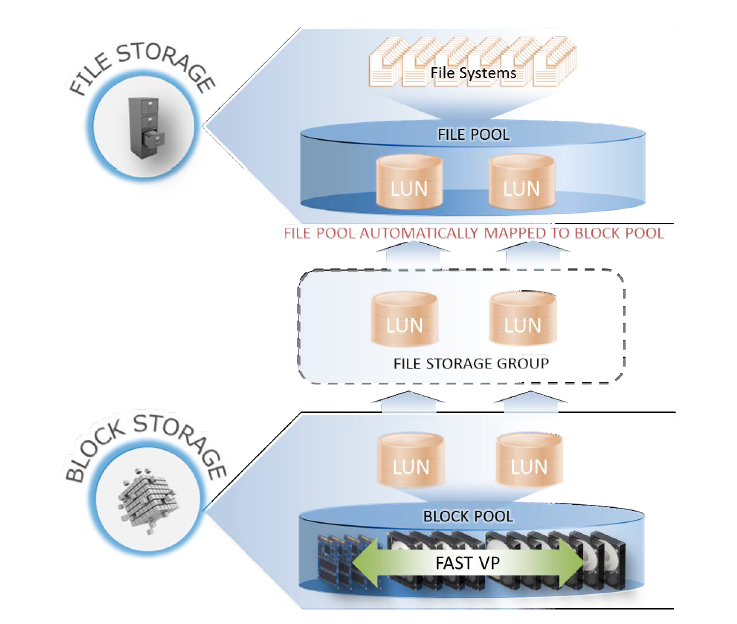 Depends on the VNX model you can use limited number of disks at once, for example maximum number of disks with VNX5500 is 80, so if you would like to create a pool from 120 disks you need to first create a pool using 80 disks, and then expand this pool with additional 40 disks. As with RAID groups, the same is with Pools, you cannot shrink the pool. To release some space you would have to completly destroy the pool.